Kim gave me a copy of Good and Easy Eats Ebook to review before its December 10th launch and I have to say, I am impressed! All 70 of the vegetarian recipes are dairy-free, egg-free, soy-free, yeast-free, wheat-free and gluten-free. There are a hand full of recipes that call for nuts but they are usually optional. There are no refined oils or sweeteners listed, and most of the ingredients can be found at your local grocery store. Cooking allergy-free often requires a great deal of creativity and Good and Easy Eats does not disappoint. There are several innovative and impressive sounding recipes including a variety of muffins, biscuits and lentil cakes. There is even a recipe for allergy-friendly biscuits and gravy! Good and Easy Eats would be a goldmine to a new cook. It contains quite a bit of teaching including several how-tos such as how to cut an onion, how to make a green salad or fruit salad, and how to cook dried beans or rice. Did I mention there are 70 recipes? I am most excited to try her dairy-free and soy-free recipes for sour cream and ranch dressing using sunflower seeds as the base. I read a similar recipe using sunflower seeds in Wild Fermentation this summer but completely forgot about it! I am so glad Kim brought it back to my attention. Are you ready to win Good and Easy Eats? Subscribe to Real Food, Allergy Free email updates, follow @RealAllergyFree on Twitter or follow us on Facebook. If you already subscribe or follow us, leave a comment letting me know. This giveaway will end on Friday, December 9 at 10:00 PM EST. The winner will be selected by random.org and will have 7 days to respond or a new winner will be chosen. Open to residents of the USA. 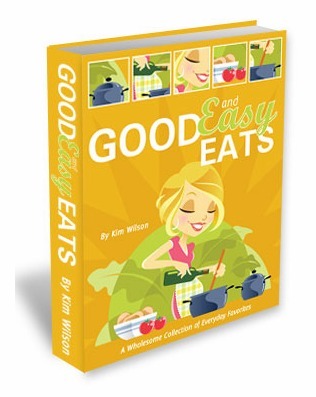 Disclaimer: Kim Wilson provided me with a free copy of Good and Easy Eats to review. I was not under any obligation to write a positive review or sponsor a product giveaway in return for the free product. All opinions are my own. My family is mostly vegetarian, so I am always on the lookout for new vegetarian recipes. I would love to get that recipe for dairy-free, soy-free sour cream & ranch! Pick me! Please enter me in the contest! This is exactly what I’ve been looking for! Need more recipes!!! Would love to win! My husband was recently diagnosed with Meniere’s, and we have a son with food allergies, so I know I would use these recipes! I subscribe to your blog via email. Pick me!! I really want to win this cookbook! My daughter is allergic to peanuts, eggs, and milk – would love to try more recipes for her!! I follow you on Facebook and love your recipes! I would love to win this cookbook. It sounds like it is full of recipes that would actually work for me and be simple/easy enough for me to do while I’m in school. I want to win! I had just recently found Kim on an internet search for allergy friendly recipes, but I haven’t tried any of her recipes! I want to win, I want to win, I want to win!!! I just signed up to follow you on Facebook. I have been diagnosed with multiple chemical and nutritional sensitivities that make it very difficult to eat a lot of foods. I would like to be able to cook foods and have variety back in my diet. I would love to win this! I’m always looking for new recipes for my daughter who is allergic to peanuts, eggs, wheat, and garlic. I would love to win this! Would be great inspiration for new meals for my son (allergic to dairy, soy, egg, corn, tomatoes). Would love to win this! My son is allergic to dairy, soy, eggs, corn and tomatoes. Always looking for new inspiration! I developed a severe peanut allergy at age 21 and it has been so challenging changing my diet to be completely peanut free. I feel like I’m missing out on so many good foods (especially around Christmas!!!) but I know there are equally yummy peanut free options out there! Im trying to raise our son vegetarian and allergy friendly too-boy it’s challenging!!! Looking forward to some new recipes!! I’d LOVE to win! And thanks for your kind comment & linking up at H2W this week! Hope to more of you!